The Salar are a small dark people who wear embroidered jackets and round felt hats. 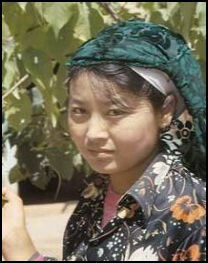 Closely related to Uighurs and Uzbeks, the live mostly in Xunhua Salar Autonomous County in Qinghai Province and elsewhere in Qinghai and Gansu Provinces. They descended from a Turkmen tribes that originated in the Samarkand area in Central Asia and lived for many centuries under Mongol rule. They began migrating to Qinhao around 700 years ago, mixed with Tibetan, Hui and Han people and were crushed by the Qing dynasty after they revolted in 1781. The Salar call themselves "Salar", or "Sala" for short. 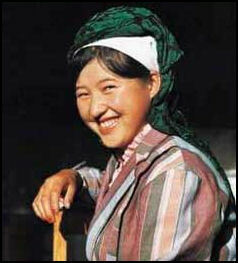 They are the product of the long-term merging of people that moved east to the Xunhua region from Samarkand in Central Asia in the 13th century with the surrounding Han, Hui, Mongolian and other ethnic groups. In the past they were known by various names, including "Sala", "Salar" and "Shala". After the founding of new China, they was formally named the "Sala nationality". The Salar are Hafanai Muslims who converted to Islam in 17th and early 18th centuries and have been involved in several Muslim revolts. The dead are buried without coffins in a Muslim funeral. Money, tea leaves, salt and other goods is thrown into the grave. There is a funeral feast three days after the burial. Marriages were usually arranged. and a bride-price was usually paid in horses. The wedding took place in the bride’s home and was conducted by the village ahung (Muslim priest). The wife lived with the husbands family. Only women could seek divorces. The Salar language belongs to Turkic language group in the Altai language family as is similar to the language of the Uyghurs and Uzbeks. It is divided into two local dialects— Jiezi and Mengda—and has incorporated many Chinese and Tibetan loan words. Nowadays, most young and middle-aged Salars know how to speak Chinese. Written Chinese is also accepted as the written language of the Salar. Most Salar are farmers, with forestry and animal husbandry serving as subsidiary industries. The Salar manage many orchards and are famous for growing pears, apricots, grapes, Chinese dates, walnuts, melons and other fruits. The Xunhua region where they hail from is known as "the land of melons and fruits". The region’s egg shell walnuts are particularly famous. The Salar have traditionally lived in villages with their own mosque and cemetery and resided in mud brick courtyard houses not unlike those of the Uzbeks in Uzbekistan. Within the courtyards they raise fruit trees. Around their villages they grow wheat, barely, buckwheat, potatoes, walnuts, vegetables, melons, apples, grapes, apricots and other fruits. The also raise sheep for mutton and wool. Their houses are mainly built of wood and mud with flat roof, and they are surrounded by adobe walls on four sides to form a yard. Inside the house, there are usually Arabic calligraphies in Kufi script pasted on the wall. They place white stones on the top of the corner of the yard walls, which is similar to what the local Tibetans do. Salar men are known as skilled woodcarvers. They embellish doors widows, rafter and colonnades with their designs. The Huaer Festival lasts for five days and is celebrated between the 4th and 6th lunar months in May, June or July by the Han, Hui, Tu, Sal, Dongxiang and Baoan peoples in the northwest provinces of Ningxia, Gansu and Qinghai. A huaer is a kind of folk song that is popular among these people. Most huaer songs are improvisations, sung by one or two people, with long and prolonged sonorous tones which have both a lyrical and a narrative content. In the singing competitions, which are held on a stage, singers are given a subject and they quickly have to compose a song about it. There are individual, duet and team competitions and participants are judged on their singing, their improvisations and their words. Sometime the singing is gentle and soft. Other times it is more forceful. Most Salar qu are "love songs" that express the love between male and female youths. Traditional songs date back to a time when marriages were mostly arranged and singers sang both of their love for the one they are betrothed to and the desire to break free from the marriage and be with their truly beloved. Feelings were often expressed through analogies. The structure of each qu complies with certain rules but otherwise is comparatively free. The number of sentences in each song phrase or short poem is fixed at four, six or eight sentences. Generally there are five words in each sentence, with certain words inserted to enhance the rhythm and melody. The last word of each sentence was pronounced rising and falling, melodiously. The songs aim to easily express the passionate and profound feelings of singers. Among the Folk songs loved by the Salar are "Yu'r" (love song), Salar "Hua'r", banquet songs, folk rhymes, work songs, children's songs and cradle-songs. "Yu'r" is one of the main forms of Salar qu. These love songs have traditionally been sung by young people in fields, open country and other out-of-the-way places. Singing them in the villages and houses is strictly forbidden. "Yu'r" have traditionally been sung by young women and men who wanted to choose their partners. Famous Yu’r songs include Baxi Guliuliu, Salar Saixibuga, King Awuni and Beautiful Girl Jugumao. In the beginning part of the drama, two people engage in a dialogue. One asks and the other answers as they narrate the story of the long and arduous journey of the ancestors of the Salar. 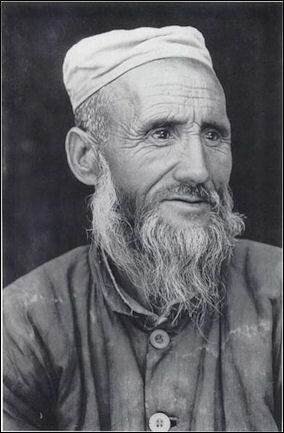 In the latter part, a person who acts as an Islamic teacher reads and sings verses in the Salar language, narrating how the ancestors of the Salar ended up into Xunhua. Generally, the performances are held under moonlight and the audience sits around in a relaxed manner participating in the dialogue. Skin rafts are strong and durable, and light enough that they can be shouldered, carried and moved by only one person. The Salar people in the region of Dahejia, Gansu province often use cowhide rafts when crossing the Yellow River. There are two kinds of cowhide rafts: big and small. The big cowhide rafts are bound with six to eight cowhide bags arranged in parallel rows, while the small rafts only have four cowhide bags, connected in a square shape, with sticks bound up horizontally over them. The big rafts can carrry more than 20 people, and the small rafts can carry seven or eight people. When crossing the river, the passengers sit on the middle part of the raft. Three to four sailors stand on the bow and stern of the raft, using oars and poles to guide and steer the craft, shout out work songs in unison. Generally, the raft drifts a considerable distance downstream before it reaches the opposite bank. In the past, people bargained with fingers in their sleeves. Because the sleeves of the fur-lined jackets they wore in winter and the clothes they wore in summer are were very long and wide, it was very convenient to bargain in sleeves. These days, the sleeves of both the fur-lined winter jackets winter and summer clothes are very short, small and thin so it is so not convenient to negotiate prices in sleeves. Sometimes the bargaining is done under the front of the clothes or a sheepskin but the mode of pinching fingers has not changed.